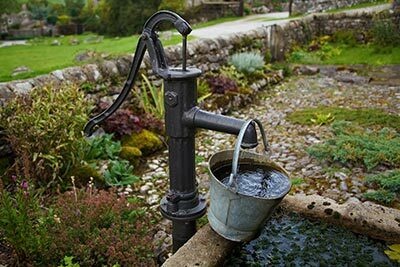 Water wells have their advantages over tap water, but it requires the installation and maintenance of your own equipment. A properly functioning well pump is a critical part to the system, so it is often a point of failure. Unless there is a blown circuit or switch, it rarely simply stops working — typically it slowly declines in its performance. So how do you tell if your well pump is going bad? This can be a sign of a failing well pump, but sticky valves and a failing pressure tank can cause this warning sign as well. Also, your pump can get clogged with iron bacteria if your water is high in iron. A special cleaning to reduce the iron can help prevent this issue. If your faucets are spitting air intermittently with the water this can be a big warning sign. If the water table drops at or below the well pump, the pump can pull in some air. This is worst case scenario as it could require drilling the well deeper. Also, if the (iron or plastic) pipe that connects the pump to the water system has a crack, it can cause this same issue. These cracks can usually be repaired by a professional like A&T Well and Pump. Usually a well pump is installed 10+ feet above the bottom of the well, but over time the well can “silt in” which adds sand and silt to the bottom of the well. Sand and silt is extremely rough on the pump, so if the pump starts pumping it through it will rapidly decline in performance. Also, if the screen that is supposed to filter out sand and silt becomes comprimised, it can get into the pump and cause damage. Regardless, if sand or silt is detected in the water, the root problem should be fixed ASAP. If there is any change in your water’s taste, smell, or color, it is a sign worth paying attention to. While some of these issues can be caused by a failing water pump, many of them point to another type of issue. When you notice such a change it’s smart to stop drinking the water and immediately get the water tested. If you water pump is running way more often than it typically does that is a symptom of a larger problem. Leaks in the well pump or in the home can certainly cause the well pump to run constantly. Other likely causes include: well casing, liner, or screen. However, the most likely cause is a check valve that is malfunctioning. The purpose of the “check valve” is to stop water from flowing back into the well from the pressure tank. So when this valve stops functioning properly, the water goes back into the well which causes the pressure switch to turn the pump on constantly. Seems obvious, but if you hear anything out of the ordinary there could be something wrong worth investigating. Many of the previously mentioned issues can cause the pump to work harder than it should, which you might notice first in the size of your electric bill. Hopefully this article helps you quickly recognize when your well pump is starting to fail so you can catch it before it stops working entirely. A new well pump is $1000 to $2000 based on the type of installation, so it’s worth it to schedule regular inspections and maintenance to keep your well pump running optimally. Need to Get Your Well Pump Serviced? If you live in the greater Raleigh area, consider A&T Well and Pump, a reputable company that specializes in well drilling, maintenance, and repairs. They will test the water, inspect the well, make any necessary repairs, and then disinfect the well before you resume using the water. If you have any of the concerns detailed above, or just want to get some routine testing and maintenance done, contact us today by calling 919-291-4063 or by filling out the appointment request form at the top of the page.